The easiest and the cheapest way to get a long term visa for the Philippines, is the Balik Bayan Stamp in your Passport. This stamp is good for 1 year and can be extended at least once for another 6 month. The Balik Bayan Visa is for former Philippine citizens and direct relatives of Filipinos such as husbands or wifes. your Filipina wife or husband must be together with you. Most importantly: You have to ask the Immigration officer for it, they won't give it to you automatically. The immigration officer is not obliged to issue a Balik Bayan Visa even if you meet all the requirements. Nevertheless, it is rarely denied. 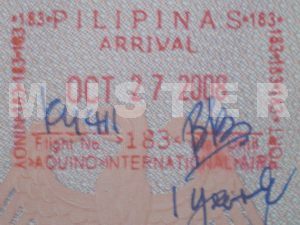 The Balik Bayan Stamp is available for direct relatives of Filipino citizens and former Filipinos who have changed their citizenship to another country. If your Filipino husband or wife still has a valid Filipino Passport, he or she doesn't need a Visa or stamp in their Passports of course. Note: The BB Visa stamp is not available for Indian citizens and other countries which are NOT listed under EO 408!